^ Stokes, George (1851). 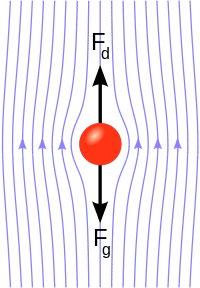 “On the Effect of the Internal Friction of Fluids on the Motion of Pendulums”. Transactions of the Cambridge Philosophical Society 9: 8–106. Bibcode: 1851TCaPS...9....8S. ^ Reynolds, Osborne (1883). “An experimental investigation of the circumstances which determine whether the motion of water shall be direct or sinuous, and of the law of resistance in parallel channels”. Philosophical Transactions of the Royal Society 174 (0): 935–982. doi:10.1098/rstl.1883.0029. JSTOR 109431. ^ a b Rott, N. (1990). “Note on the history of the Reynolds number”. Annual Review of Fluid Mechanics 22 (1): 1–11. Bibcode: 1990AnRFM..22....1R. doi:10.1146/annurev.fl.22.010190.000245. ^ Batchelor, G. K. (1967). An Introduction to Fluid Dynamics. Cambridge University Press. pp. 211–215. ^ Fox, R. W.; McDonald, A. T.; Pritchard, Phillip J. (2004). Introduction to Fluid Mechanics (6th ed.). Hoboken: John Wiley and Sons. p. 348. ISBN 0471202312. ^ Streeter, V. L. (1962). Fluid Mechanics (3rd ed.). McGraw-Hill. ^ a b Rhodes, M. (1989). Introduction to Particle Technology. Wiley. ISBN 0471984825. http://books.google.com/books?id=P9Qgvh7kMP8C&pg=PA29. ^ Dusenbery, David B. (2009). Living at Micro Scale. Cambridge, Mass: Harvard University Press. p. 49. ISBN 9780674031166. ^ Sinnott, R. K.. Coulson & Richardson's Chemical Engineering, Volume 6: Chemical Engineering Design (4th ed.). Butterworth-Heinemann. p. 73. ISBN 0750665386. ^ Holman, J. P. (2002). Heat Transfer. McGraw-Hill. p. 207. ^ De Witt, D. P. (1990). Fundamentals of Heat and Mass Transfer. New York: Wiley. Zagarola, M.V. and Smits, A.J., “Experiments in High Reynolds Number Turbulent Pipe Flow.” AIAApaper #96-0654, 34th AIAA Aerospace Sciences Meeting, Reno, Nevada, January 15–18, 1996. Jermy M., “Fluid Mechanics A Course Reader,” Mechanical Engineering Dept., University of Canterbury, 2005, pp. d5.10. Truskey, G.A., Yuan, F, Katz, D.F. (2004). Transport Phenomena in Biological Systems Prentice Hall, pp. 7. ISBN 0-13-042204-5. ISBN 978-0-13-042204-0.